Not sure if anyone can help, just to expalin abit more. Im just intrested to know are Mountain Rescue Teams and other search teams allow to respond on Blues and Twos (sorry old term). to our international Members do you have services what arent normally front line responders which respond with lights and sirens? Our Alliance Website Click Here. Come and Join us there is a space for every type of player. Depending on your opinion of the word international... I’m from the US and I know that here in St. Louis we have tow trucks with red/blue lights and sirens. I personally hate it. sorry should of explained it better. international to me is everywere outside of the UK. tow trucks as is a lowloader type. (wonder why they have lights and sirens) have you ever seen them responding or do they just use the lights when loading a car for towing? In my area (Upstate NY) they only use their lights (ambers) when loading or transporting a vehicle. Lowloader or hook. They use their lights and sirens when responding to a scene and when operating, and yes I have seen them. So i would know here in NYS, Tow Trucks here use (Ambers) No sirens. I have not seen a tow truck in my past 5 years use different lighting or a siren that would be illegal to have a siren on any DOT or public safety vehicle. could the tow truck belong to a state emergency service rather then private owned. In St. Louis MoDOT does not operate tow trucks but there are emergency response vehicles (like squads) with red/blues and sirens. The tow trucks also have red/blues and sirens and ARE privately owned. Iowa also classifies wreckers as "emergency vehicles" and towing services are allowed to use red/blue lighting specifically when they are on scene. Unless extreme circumstances apply (several mile traffic backup, for example) they cannot use red/blue lights while responding or after they have departed. They cannot use sirens as far as I'm aware. They are all privately owned. This was explained to a coworker of mine who specifically asked Motor Vehicle Enforcement about this after he noticed towing companies running red/blue (who subsequently explained it to me). - Rural mail carriers typically will have an amber strobing light on the top of their vehicles that runs continuously while on their delivery routes. - Highway Helper program only uses lighting (amber) when on scene. - I've only personally seen a few POVs belonging to volunteer firefighters. Only one had any additional lighting, and it was just a single rotating dash light in white. - Funeral procession cars are permitted purple lighting, if memory serves correct, while conducting a procession but I don't think they're allowed sirens. Fire Trucks, Ambulances, Police have red lights with blue facing rear, and sirens. POVs owned by fire chiefs have emergency lights and siren as they are an emergency vehicle. POVs owned by members of volunteer ambulance corps have green lights, no siren. No other vehicles are allowed these lights. But your mountain rescue thing, that is an emergency service. In NYS those are firefighters in the departments that are trained for Search & Rescue and in places separate agencies that are still considered emergency services. I have seen a Few mountain Rescue teams from accross the UK have blue lights fitted. but i wasnt sure if they 'respond' on blues and two. also the RAF and RN have mountain rescue teams but not sure if they respond on 'blues and twos' either. Yes Stuart, they can respond on Blue Light's and Sirens. RN doesn't have rescue teams but does have blue light (and blue/yellow battenburg marked) vehicles for explosive ordnance disposal teams to respond across the UK. Also, some private ambulance companies can use blue's but it depends on the county in England. Coastguard teams have blues on their vehicles but they cannot use the exemptions for blue light use like police, fire and ambulance. 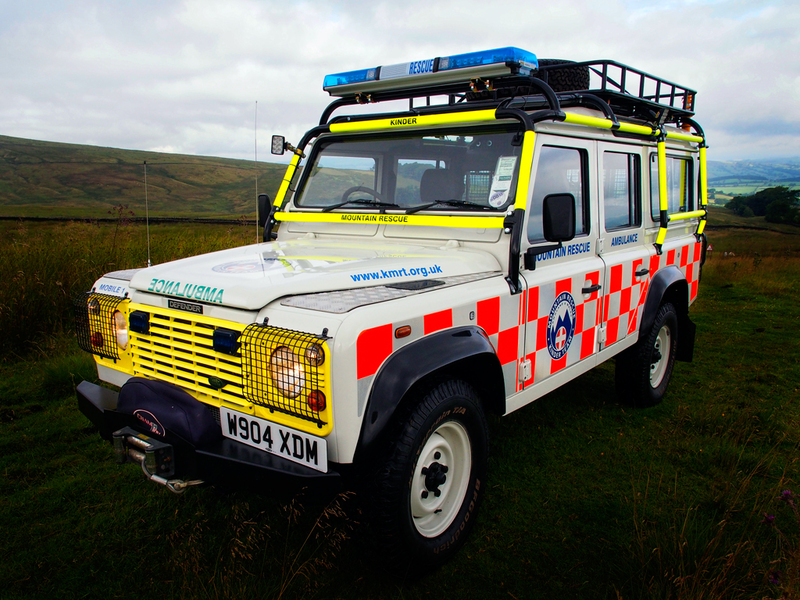 Mountain Rescue Teams have blues on their vehicles in England and Wales.